For an early Wednesday morning, there sure seemed to be an over-size throng of skiers and boarders in the lift lines at Whitewater Ski Resort. Word had gotten out in nearby Nelson, British Columbia, that about a foot of light snow had fallen overnight at the resort. When the snow hits that hard, it’s understood that powder-hungry residents will be late for work and classrooms will be half empty that morning. Whitewater, just outside Nelson and 149 miles north of Spokane, gets legendary snow virtually every winter. This is a rare resort: no snowmaking system. When Mother Nature delivers over 40 feet every winter, who needs it? Shortly after we left the slopes in early March, the flake count was 394 inches and rising. Three chairlifts, including a new quad what went in last summer, fan across some 1,174 lift-accessed skiable acres. Add in the adjoining backcountry and the skiable terrain goes to 2,367 acres. More than half of the 82 runs are black diamond or double diamond, but there still seems to be plenty of bunny and intermediate slopes. Toss in a terrain park and five kilometers of nordic trails. There is no lodging at the base. But Nelson is only 20 minutes away and seems well populated with hotels and motels. At the resort base is one of the tastiest ski resort cafes I have ever sampled – Coal Oil Johnny’s. Whitewater has a lung-friendly, low level elevation with a base of 5,400 feet and a vertical drop of 2,044 feet. There are no high-speed lifts, which is bonus because the powder does not get skied out that quickly. The resort, which is laid back and below the radar of many skiers and riders, likes to say we are “humble yet huge.” Our adult lift ticket worked out to $68 (U.S. dollars). And ticket prices are the same every day. The resort has been operating since the 1970s. One of the delights of coming to Whitewater is the proximity of Nelson, a historic jewel nestled in the Selkirk Mountains and along the West Arm of Kootenay Lake. Nelson, which boasts more than 350 preserved heritage buildings, has the feel of being there forever. Nelson likes to call itself the “number one small arts town in Canada,” and it’s bursting with public art, galleries, live theater and performance venues along with a number of street musicians who perform when it warms up. Be sure and visit the Hume Hotel, a picturesque structure that opened in 1898. The vibrant life span of the town, which has about 10,000 residents, can be viewed through the history of the hotel. We had a number of to-die-for dishes in Mike’s Place at the hotel. When the weather turns foul, a good break from the slopes is beer tasting. Nelson has four breweries. My favorite, with their ample pours and styles I enjoy, was Torchlight. And after imbibing into the evening, be sure to try some amazing mountain cuisine. Two great choices are Louie’s Steakhouse and the West Coast Grill. 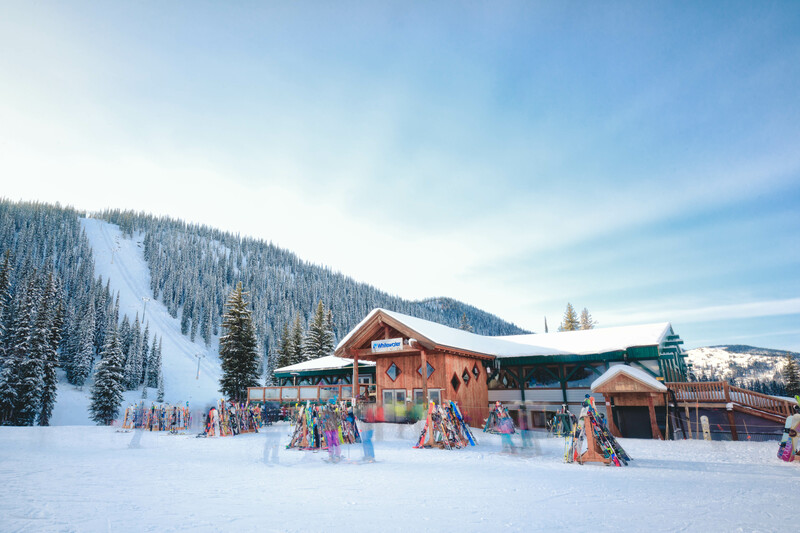 Whitewater Ski Resort, famous for its deep powder and seemingly endless terrain, has become the 14th member of the Powder Alliance, a collection of ski and snowboard resorts throughout the western United States and Canada that can be accessed with the use of one “anytime season” pass. Located in the Selkirk Mountains near the town of Nelson, British Columbia, Whitewater receives an average of 40 feet of snowfall every winter. “If you don’t know Whitewater, you should — 2,044 vertical feet of steeps, deeps, chutes and bowls. It’s an epic winter adventure with the most unbelievable food,” said John McColly, spokesman for Mountain High resort in Southern California. Ratings: The resort has the best deeps, bowls and glades, according to Ski Canada.